I had a hunch this App would help dealers close more sales, so I talked to Laredo Product Manager, Josh Staley. Because OEMs build so many amazing innovations into their units – and because – dealer sales reps are often handling 10 to 20 different products, it can be difficult for OEMs to get ALL of the advantages of their brands communicated all the way through to the retail buyer. Enter the handy new Laredo App. And, most important – every selling advantage of the Laredo … on their smart phones or tablets. How big is the awning? What are the tank sizes? How is this unit better than the next unit? This app represents a welcome advance as traditionally, there hasn’t been a lot of consistency from OEMs as to how they communicate this information to reps. Now, all the information is in the palm of your sales rep’s hand. Sales reps like the Laredo app because they are not “making up answers” – or worse yet – they don’t have to tell the customer they’ll get back to them later – with answers. This app helps ensure the customer doesn’t walk away – without answers – about the Keystone Laredo, at least. Dealers like the app too. It makes their best sales reps even better. Plus, the app is so thorough and so complete that – in a pinch – even a technician (like a designated hitter) can fully demonstrate a Laredo simply by following the full walk-around info within the app. Download it now, and give it a whirl! Staley notes that inventory turn times have improved greatly (compared to before the app) – especially for new floor plans. I surmise, but this makes sense as reps with “app-in-hand” might be more likely to tackle a full blown retail demo on a new floor plan rather than steering active buyers away from the new unit until they’ve had time to learn it well. And of course, Staley watches the Laredo app open statistics “spike” on the weekends when reps are accessing it most during their retail demos. Staley predicts that in 2 yrs. all brands will likely have apps. And if you consider the magnitude of the current communication challenges, it can only be a matter of time, really. Let’s say any given OEM brand has 4 factory sales reps on the road handling up to 50 dealers each. Each dealer may have between 2 and 20 (or more!) sales reps. So with factory reps supporting literally hundreds of dealer reps in the field, an app with full and complete information on a mobile device makes perfect sense. The OEM’s basic issue remains the same – IMHO. Manufacturers need to find more ways to tell consumers why their brands are THE brands to buy. In addition to advertising directly to consumers (stay tuned … more about this to come on RVAdvertiser), and educating consumers directly about their brands while driving more and more educated buyers into dealerships, an OEM app like Laredo nicely closes the loop and “arms” the field rep with all the info they need to help make the sale. A timely and refreshing idea, for sure. RVAdvertiser kudos to Josh Staley and the Laredo Product Team! Are you using the app? Has it helped you close a deal? What other apps are out there (or under development now) that dealers might want to know about? Buyer family arrives at dealership, wants a 5th wheel. Rep determines needs and decides to show the family 2 units. The Laredo and another OEM’s 5th wheel model. Rep goes through the Laredo – with the app open – and covers ALL the awesome features & benefits of the Laredo thoroughly and completely. A great demo / presentation. Rep moves on to demo the next unit. “Wings it.” Does a decent job but not a brilliant job of the demo. Wondering in this scenario, which unit the family would be most likely to favor? Your thoughts? Can you see this happening? Or, is this scenario too “far-fetched”? 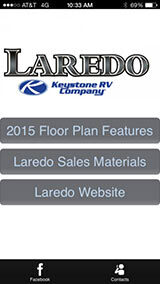 An RV consumer downloads the Laredo app. Learns which Laredo they want and understands why the Laredo is the superior product, perfect for their family. Buyer keeps pulling rep back to Laredo because buyer has strong knowledge of Laredo specs and all the key differentiating attributes of Laredo. Your thoughts? Is this a likely scenario? Or would this be “highly unlikely” even if buyers were able to get a hold of and thoroughly explore an app like the Laredo app?